One of the most compelling things about retreats and workshops of this kind, is how they bring together people from all over the world. A “creative zone” beyond borders and boundaries is formed, where everyone embraces the joy of one of our basic needs: food. Join us to make new “creative zones” and become THE GATHERERS of precious ingredients and cherished moments, soulful dishes and joyful experiences, new friendships and up-to-date knowledge, strengthening in this way human interaction through the celebration of life! Saffron flowers (crocos in Greek) are some of the most beautiful wildflowers in Greek nature. They bloom almost all year long; in the southern part of Greece in the fall and in mountainous areas throughout the winter, spring and summer. According to historians there was plenty of saffron in the southeastern Mediterranean in antiquity. 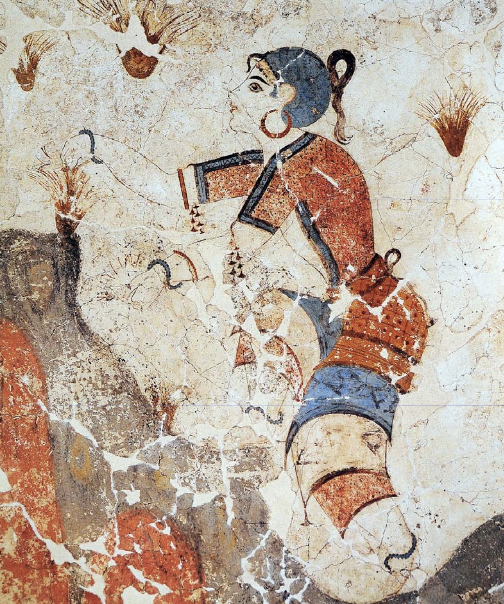 It is also known that the famous wall paintings showing saffron gatherers in Santorini (Akrotiri) and Crete (Knossos) are aged 35 to 38 centuries (Bronze Age). We chose this title for our retreats because the “Saffron Gatherers” wall painting in Santorini is not just about women collecting herbs. It is an emblematic image of how the human-nature relation is achieved through a women’s ceremony or celebration. Saffron, through its remarkable existence, symbolizes all the reasons that make us gather around a table to photograph a dish, capturing a meaningful moment: its preciousness and deliciousness, its special flavorful identity, its multiple properties and bright colors. In Le grand dictionnaire de cuisine Alexandre Dumas states that Victor Hugo considered saffron as “more a light than a spice”. Homer in Iliad likens the dawn to the color of saffron. Indeed, saffron’s color, a mature yellow with a little orange, resembles the sunlight – a light impossible for technology to imitate, a light holding the power to give and preserve life. It is also a symbol of what Greek cuisine represents and seems like an oxymoron: a simple miracle that happens in front of us while cooking a simple dish with fine, native ingredients gathered with great human labor, following age-old techniques. 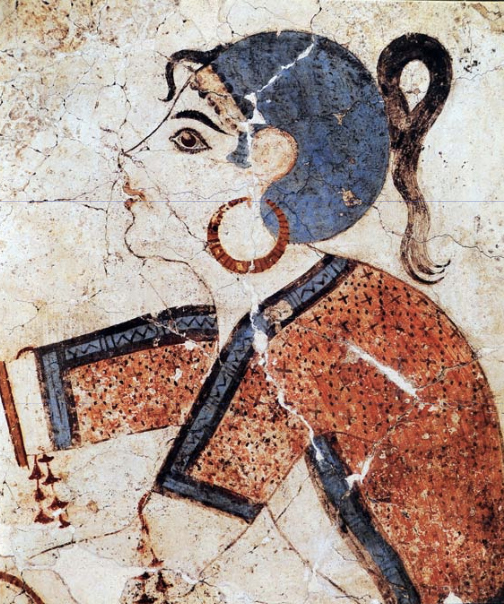 The fact that the saffron gatherers in Santorini’s wall paintings are young women is not accidental. They can climb on the rocks and collect the flowers with their elegant, gentle fingers. Gathering the flowers and removing the stigmas is of great difficulty and should only be done by hand. An enormous amount of effort goes into a delicate flower: 200.000 flowers yield 1 kg/2.20pounds of the spice. Hermes, the Greek god of trade and messenger of the gods in ancient Greece, while playing with his childhood friend Crocus, fatally hit him on the head by accident. Three drops of Crocus’ blood spilled on the flower, creating the stigmas. Therefore, the saffron spice absorbed the blood at birth -the essence of life as well as Hermes’ repentance for the irrevocable of death of his beloved friend. Evidence of saffron being used as an aroma in cooking, a pharmaceutical material and a dyeing material in ancient pottery, is found in Linear B written texts (Mycenaean Greek) and in Aristotle, On Colours. Homer in Iliad writes that when Zeus embraces Hera, saffron flowers start blooming around them like small purple explosions, poetically expressing saffron’s aphrodisiac nature. There is extensive reference to saffron in texts related to the campaigns of Alexander the Great and Byzantine cuisine. Saffron was also used to make the halo of saints in Byzantine icons and capital letters in Byzantine manuscripts; Byzantine icons and books survive until today.